Complex Byala Cliff Center - first line from the beach! 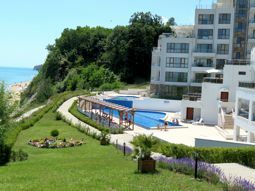 Complex Byala Cliff Center - apartments for rent on the beach in Byala town, Bulgaria with amaizing sea view! Complex Byala Cliff Center is located in the picturesque resort town of Byala. The complex is located first line from the beach with beautiful direct sea view. The complex was built on step levels, allowing almost all of the apartments at Byala Cliff Center to offer its guests and visitors beautiful views to the sea. The sandy beach of Byala is only 80 meters from the flats. The complex also offers two outside swimming pools with sunbeds and view to the sea from the pool area. The complex consists of two blocks – A and B, surrounded by green areas and the swimming pools and sea in front. Available for the guests of the complex there is an outside tent area with tables and chairs where you can have your morning coffee or evening cocktails while enjoying the sea breeze and listening to the waves of the sea. 24-hour concierge and daily Manager take care of the needs of our guests. Free parking for all guests of the complex. Byala Cliff Center Complex offers three types of apartments – studio; one bedroom apartment and two bedroom apartment; All apartments have built-in kitchens equipped with everything necessary for cooking and eating, as well as a dining table with chairs; spacious living room with a sofa bed, one or two people can sleep comfortable; air conditioning; cable tv and free Wi-Fi; terrace with rattan furniture for your morning coffee or an evening cocktail with frontal or partial sea views; modern bathroom with a shower cabin, toilet and sink. Studios are suitable for 2 or 4 persons; one bedroom apartments are suitable for 2 to 4 persons and apartments with two bedrooms for 4 to 6 people. Enjoy your beach holiday in Bulgaria with us in Byala Cliff Center Complex! Holiday studio for rent in Byala town - Byala Cliff Center complex - first line from the beach. Studio A84 offers comfortable sofa-bed, fully equipped kitchen; dining area; tv with cable tv and wifi internet; bathroom with shower; balcony with sea and pool view. Apartment is suitable for 2 people. Self-cataring beach holiday studio - on the beach in Byala town. Studio A11 offers double bed, sofa-bed, fully equipped kitchen; dining area; tv with cable tv and wifi internet; bathroom with bath; Large balcony with sea and pool view. Apartment is suitable for 2/4 People. Holiday apartment with one bedroom suitable for 2/4 People in complex Byala Cliff on the beach. The apartment offers one bedroom; one bathroom; living room with sofa bed where two people can sleep; dining area with table and chairs; fully equipped kitchen; balcony with nice sea and pool view; apartment is perfect for family vacation with children. Self-cataring beach holiday apartment for rent in Byala - on the beach in Byala town. Apartment B32 is with partial side sea view. Apartment is with one bedroom; living room with sofa bed; fully equipped kitchen; dining area; tv with cable tv and wifi internet; bathroom with bath; Apartment is suitable for 2/4 People. Vacational self-cataring apartment for rent in Byala - on the beach in Byala town. Apartment B42 is with partial side sea view. Apartment is with one bedroom; living room with sofa bed; fully equipped kitchen; dining area; tv with cable tv and wifi internet; bathroom with bath; Apartment is suitable for 2/4 People. Apartment for rent on the beach in Byala. Apartment A42 is with wonderful sea view. Apartment is with one bedroom; living room with sofa bed; fully equipped kitchen; dining area; tv with cable tv and wifi internet; bathroom with bath; Apartment is suitable for 2/4 People. Apartment for rent on the beach in Byala. Apartment A62 is with wonderful sea view. Apartment is with one bedroom; living room with sofa bed; fully equipped kitchen; dining area; tv with cable tv and wifi internet; bathroom with bath; Apartment is suitable for 2/4 People. Apartment for rent on the beach in Byala. Apartment A63 is with wonderful sea view. Apartment is with one bedroom; living room with sofa bed; fully equipped kitchen; dining area; tv with cable tv and wifi internet; bathroom with bath; Apartment is suitable for 2/4 People. Apartment for rent on the beach in Byala. Apartment A64 is with wonderful sea view. Apartment is with one bedroom; living room with sofa bed; fully equipped kitchen; dining area; tv with cable tv and wifi internet; bathroom with bath; Apartment is suitable for 2/4 People. Holiday apartment for rent on the beach in Byala. Apartment A92 is with wonderful sea view. Apartment is with one bedroom; living room with sofa bed; fully equipped kitchen; dining area; tv with cable tv and wifi internet; bathroom with bath; Apartment is suitable for 2/4 People. Holiday apartment for rent on the beach in Byala. Apartment B11 is with wonderful sea view and direct access to the pool area. Apartment is with one bedroom; living room with sofa bed; fully equipped kitchen; dining area; tv with cable tv and wifi internet; bathroom with bath; Apartment is suitable for 2/4 People. Self-cataring beach holiday apartment - on the beach in Byala town. Apartment A91 is with amazing sea and beach view from big balcony with outdoor furniture. Apartment is with one bedroom; living room with sofa bed; fully equipped kitchen; dining area; tv with cable tv and wifi internet; bathroom with shower-cabin; Apartment is suitable for 2/4 People. Beach holiday apartment for rent - on the beach in Byala town. Apartment B31 is with amazing sea and beach view from big balcony with outdoor furniture. Apartment is with one bedroom; living room with sofa bed; fully equipped kitchen; dining area; tv with cable tv and wifi internet; bathroom with bath; Apartment is suitable for 2/4 People. Beach holiday apartment for rent - on the beach in Byala town. Apartment B71 is with large balcony with amazing sea and beach view. Apartment is with one bedroom; living room with sofa bed; fully equipped kitchen; dining area; tv with cable tv and wifi internet; bathroom with bath; Apartment is suitable for 2/4 People. Two bedroom holiday apartment for rent in Byala town - Complex Byala Cliff Center. A51 flat offers two bedrooms, two bathrooms, living room with equipped kitchen, sofa-bed where two more persons can sleep; TV and wi fi internet, air-conditioner; amazing sea and beach view!. Two bedroom holiday apartment for rent in Byala town - Complex Byala Cliff Center. Apartment A61 - offers two bedrooms, two bathrooms, living room with equipped kitchen, sofa-bed where two more persons can sleep; TV and Wi-Fi internet, air-conditioner; amazing sea and beach view!.